Few investors can say their venture capital careers started before their first legal cocktail. Talia Goldberg—the youngest partner in Bessemer’s history—is an exception. Much like the artists, athletes, and inventors that only become true outliers after honing their craft for more than 10,000 hours, a concept popularized by Malcolm Gladwell, building a career in early stage and growth investment is no different. To develop and maintain her expertise in consumer and software companies and emerging marketplaces, Talia has to rigorously study thousands of startups and the lessons of their founders. Every partner builds their areas of expertise and hypotheses that drive how and why they invest in specific industries. As for Talia’s investment roadmaps, they’ve required that same graduate-school level research. Talia has spent six and a half years at Bessemer doing just that. Thirteen signed term sheets later, she’s sourced and spearheaded investments in companies such as ServiceTitan, Toss, Shippo, Rabbit, Dashlane, and Vidyard. Today, she serves as a board observer for many of these companies and remains involved with the firm’s investments in Pinterest, Collective Medical Technologies, and Wikia. “The funny thing about venture capital is that it’s full of paradox. It’s comprised of exceptions and outliers but pattern recognition is still critical. I’m constantly trying to strike a balance between being opportunistic and being roadmap-driven,” Talia explains. Openness led Talia to one of her early-stage investments: Toss, now the leading consumer financial services app in Korea. By chance, Talia was introduced to Toss’s founder, dentist-turned-fintech CEO, Seunggun (“SG”) Lee. On paper, SG was a far cry from the archetypal fintech founder. But SG’s outsider perspective on Korea’s cumbersome payments industry provided the clarity needed to build a better solution. Despite geographic constraints, Talia hustled and helped the firm move quickly to commit to an investment within less than a week-and-a-half. As of 2018, Toss was valued at $1.2 billion, on an $18 billion transaction volume run-rate, and counted approximately 20 percent of the South Korean population as users. These opportunistic investments may seem like luck, but to make them, investors need to be highly skilled in pattern recognition. Most of the time, Talia’s investments are driven by her deep knowledge of consumer and software companies and emerging marketplaces. One of the many roadmap-driven investments Talia helped source and lead was ServiceTitan, which provides software and mobile apps for the field services industry. The team at Bessemer spent nearly a year meeting with technologists and startups building solutions tailored for deskless workers, most of whom were left behind by the first wave of software that emerged during the PC era. ServiceTitan fit perfectly into that roadmap. Sons of tradesmen, co-founders Ara Mahdessian and Vahe Kuzoyan were computer science majors who knew what it would take to build software solutions for field service businesses and their technicians. Today, ServiceTitan has more than 2,500 customers who depend on the platform to run and optimize their businesses. The company was recently valued at $1.65 billion. Whether opportunistic or roadmap-driven, the decision-making process to invest in a company is entirely unique—just like the partnership built between a founder and an investor. According to Talia, building a productive founder-investor relationship is one of the most challenging and rewarding parts of her job. “Trust is essential, but, beyond that, there is no one-size-fits-all formula,” Talia says. Early-stage founders have to rumble with massive challenges, among them: assembling the right team for the right stage of the company, committing to appropriate roles and responsibilities between two (or multiple) co-founders, and innovating fast enough so a company isn’t eclipsed by its competitor (without burning out the team). Talia’s passion for startups dates back to her time at college. At the University of Pennsylvania, she created her own technology-oriented major combining disciplines from The Wharton School and College of Arts & Sciences. There, Talia was a founding partner of First Round Capital’s Dorm Room Fund. 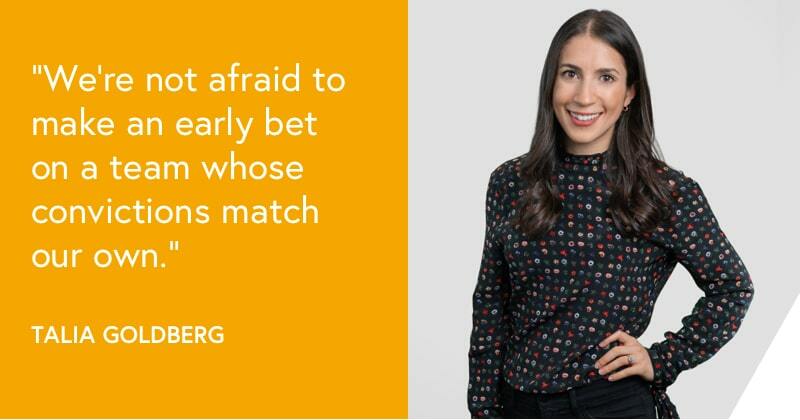 She was also an early employee for startups like foursquare, the location-based mobile discovery application, and Simple, a personal finance app later acquired by BBVA. Talia first joined Bessemer as an analyst in a program which aims to cultivate the next generation of investors. Nearly 70 percent of the firm’s current partnership joined Bessemer as an analyst or associate. Jeremy Levine, a leading internet and software investor in companies including Pinterest, LinkedIn, MindBody, Shopify, and Yelp, later took Talia on as an apprentice. Outside of work, Talia is a mentor and pod leader at Parity Partners, a non-profit dedicated to increasing representation of women and people of color in the workplace. Every month, she meets with a group of promising female investors and entrepreneurs to help them navigate career challenges and develop a peer network. Since mentorship has played such a pivotal role throughout her career, Talia is dedicated to paying it forward. On behalf of Talia Goldberg, we want to thank the founders she works with for their partnership, grit, insatiable passion, and vision. Talia also wants to thank her Bessemer colleagues for their support, guidance, and friendship, with a special shout-out to Jeremy Levine for his mentorship over the years. Read more about Talia’s promotion in Forbes and TechCrunch.